February 25, 2009 marks fifty years since Sister Genevieve of the Holy Face and Saint Therese, the last surviving sister of St. Therese of Lisieux, died in the Carmel of Lisieux on February 25, 1959. 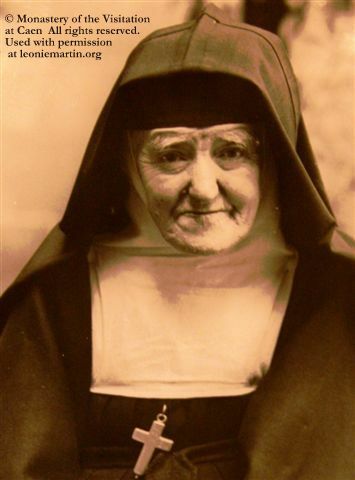 Born Marie Celine Martin, she lived at home with St. Therese until Therese entered Lisieux Carmel on April 9, 1888. For more than six years, while Celine lived as a laywoman and looked after their father, who was ill, the sisters were separated. After the death of Blessed Louis Martin, Celine entered the Carmel on September 14, 1894. As a novice she learned her sister's "way of confidence and love," of which she was a tireless apostle all her life. She made the offering of herself to Merciful Love with St. Therese on June 11, 1895, and she was the first person to read the childhood memories Therese wrote in 1895 (later the first part of "Story of a Soul"). She looked after St. Therese during her illness. She painted a famous image of the Holy Face of Jesus and many other portraits, especially of her sister. She testified at the processes for Therese's beatification and canonization and at the diocesan processes for the cause of her mother and her father, Blessed Zelie and Louis Martin. For significant dates in Sister Genevieve's life, please see (thanks to Internet Archive) the Web site of the Shrine of Lisieux. For the powerful correspondence between Therese and Celine, please see The Letters of St. Therese of Lisieux (Volume I, 1877-1890 and The Letters of St. Therese of Lisieux (Volume II: 1890-1897). For Celine's memoir of her sister, please see My Sister Saint Therese. See Celine: Sister and Witness of St. Therese of the Child Jesus, a biography by Franciscan Father Stephane-Joseph Piat, who worked closely with Celine in the 1950s to write the story of her family.